As part of the “Bridge Building, Intersectionality and Inclusion” track at JCLC 2018, panelists were able to provide overviews of (very!) 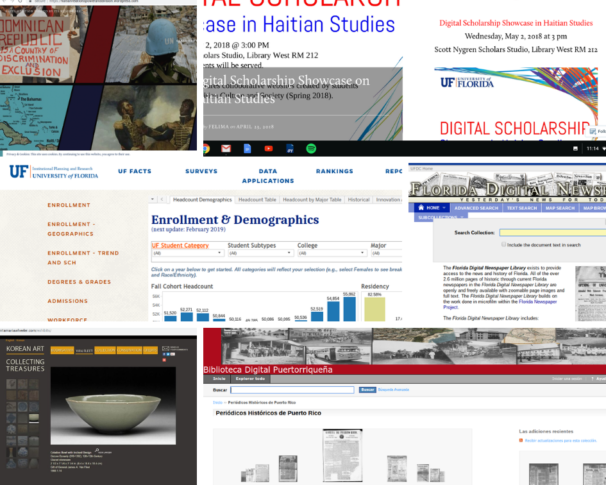 successful digital humanities projects from three exceptional individuals affiliated with the University of Florida, George A. Smathers Libraries. The panel began with an introduction to the University of Florida (UF) student demographics in order to help the audience understand the specific student needs at UF. The race/ethnicity breakdown for UF students is roughly 57% White, 15% Latino, 8% non-resident Alien (O), 7% Black, 7% Asian. Additional enrollment and demographic information about UF students can be found here: https://ir.aa.ufl.edu/uffacts/enrollment-1/ Individual presentations from each panelist continued. Lourdes Santamaría-Wheeler is the manager of the exhibition program at UF George A. Smathers Libraries. Most of the exhibitions are short-term displays (6-12 weeks), cover 11 exhibit areas, with mostly archival materials on display. From 2014 through 2017, Santamaría-Wheeler has managed three multilingual exhibits. Through the process of collaboration and finding opportunities in partners on campus, Santamaría-Wheeler has been able to put on multilingual displays both online and on physical exhibit, describing that the multilingual aspects of these exhibits have increased visibility and access to the collections. Dr. Crystal Felima described the power of integrating undergraduate students in the process of forming their own critical digital scholarship. The course taught (HAT 3564: Haitian Culture and Society) was cross-listed in African American Studies, Anthropology, and Latin American Studies. Students were required to create a digital project that “explore[s] teaching, research, student learning, and e-scholarship in Haitian Studies”. Dr. Felima focused students to review readings and studies done by Haitian scholars. This strategy showed that students can engage with resources from Haiti outside the classroom. The public facing aspect of the student’s projects (websites noted below) brought to the forefront the importance of digital scholarship for public engagement and further tasked students to highlight their thinking and projects digitally. The student projects have been highlighted in a digital scholarship showcase and will also be presented by the students in a conference in Haiti. Melissa Jerome described her work with the Florida & Puerto Rico Digital Newspaper Project, which is a study on how to improve the metadata as it relates to the requirements of the different discovery platforms used to host the newspaper content. The pilot study identified the need for multilingual metadata. As described by Jerome, Latin American and Caribbean newspaper sources have political biases and come in various languages. It is critical that the metadata contains information regarding historical context and are described in the source language. In some platforms, the newspapers are accompanied by essays for each newspaper title. This includes information about the publisher, the paper’s audience, description of general content, and whether the paper had political or other government/social ties. Jerome indicated that additional assessments will be conducted to make a bigger case to integrate multilingual metadata in additional collections on various platforms. In summary, the three projects described during this panel can be used as successful case studies to provide evidence to library administration and other stakeholders to provide library resources (people, time and funding) to support multilingual projects in the library. The benefits can be seen in the learning, teaching, and research possibilities to librarians and students, as described by the panelists.